When Alexander Anderson heard about the catastrophic Mass Casualty Incident (MCI) in Las Vegas on October 1, he immediately reported to the station, knowing he’d be needed. Alex was assigned to a decompression unit with Dr. Michael Barnum, then they raced into action to began providing care. With his advanced skills as a Critical Care Paramedic, he was able to make a difference in many patient outcomes. As the night unfolded, neither man knew how long they would be needed to run busloads of patients to the hospitals. Because of his tenure and outstanding record of service, his coworkers as well as hospital staff wish for Alex to be the responding Paramedic, should they ever need emergency medical care. Alex is extremely caring and always goes the extra mile for his patients. Alex has also helped develop many Continuing Medical Education (CME) opportunities for the local operations teams. 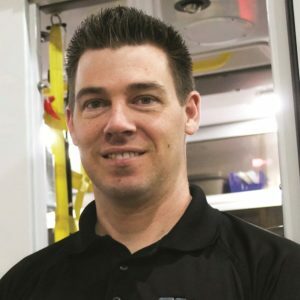 He is an integral participant in the updating of protocols for advanced response techniques like using a bus to treat and transport folks from mass causality incidents. Always humble, Alex does not consider himself a hero.